Let us first install React.js using the following commands. Type the following command to install Material-UI. Now, modify the following code inside the App.js file. Save the file and go to the browser and you can see that we have successfully integrated the Material UI. You can install the prebuild SVG icons using @material-ui/icons package. You can include the stylesheets inside the index.html file. We can use the buttons as well as icons using the following code. You can use material.io/tools/icons to find a specific icon. When importing an icon, keep in mind that the names of the icons are PascalCase. variant: The visual style of the component, either contained, outlined, fab, or empty for the default link-style. color: One of primary, secondary, or default, which is the same color as if it’s left empty. We’ll cover the customization of these colors later. mini: If the variant is set to fab (floating action button), then the size of the button is reduced. Let us create a component inside the src folder called Navbar.js and add the following code. Now, import Navbar.js component inside the App.js component. Now, you can see that we have implemented the basic design of the Navigation bar. Add a following code inside the App.js file. Save the file, and you can see the textbox. The TextField, we have imported from @material-ui/core/TextField, behaves like the standard React input component. Create one file called Card.js inside the src folder. Add the following code inside the Card.js file. Save the file and import the Card.js file inside the App.js file. To pass the styles object into our component, we will use the withStyles function to return the higher-order component that gives our classnames as a prop called classes. To create a custom theme, use a createMuiTheme function and pass its return value to a MuiThemeProvider element at root of your App. Now, all children of a MuiThemeProvider have the uniformly customizable style! All colors, including a primary and the secondary colors we used earlier in the tutorial, are all themeable. The full range of options can be found in the official theming documentation. Material-UI is a great way to add the polished look and feel to the controls of your React web application with little effort. 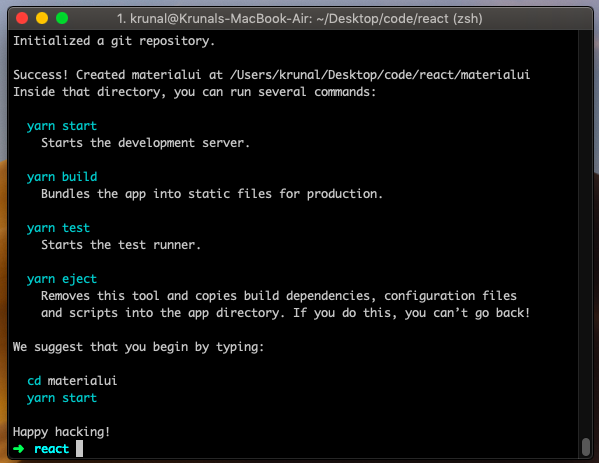 Finally, React Material UI Example Tutorial is over. Where do I get MZ.png used in Card.js?